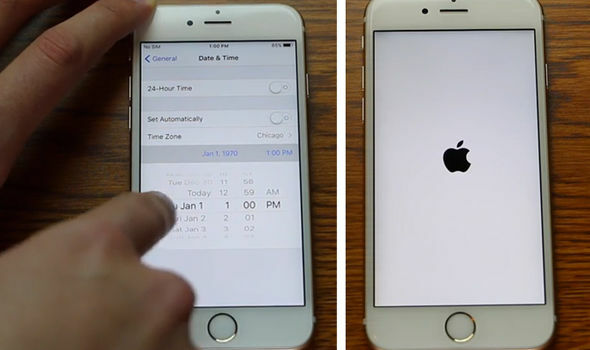 You are here: GeekSays Technology News » Apple » iPhone News » Warning: Setting Your iPhone Date Back Might Brick It! There have been reports that setting an iPhone’s date back to a specific time is all it would take to brick it completely. The reports were traced back to Reddit and several sources in China, claiming that changing the device’s Date & Time value will prevent it to boot properly. I have yet to test this myself; I can’t imagine bricking my iPhone at the moment. I highly discourage you from trying as well. This may not be something you want to try at home. However, the issue can be reproduced by setting the date back to January 1st, 1970. The process is not really that straightforward, so the risk of accidentally doing it when messing with the Date & Time settings is fairly low. To actually reach the year 1970, you need to scroll back to the year 2000, go back, and then repeat the process until you can access 1970 on the menu. The issue is affecting Apple’s 64-bit chips, which can be found in some of the more recent iPhone, iPad and iPod Touch. The affected chips are A7, A8, A8X, A9 and A9X chips. It is also not iOS-dependent, which means any version of iOS is affected by this bug. Luckily, those of you who are using 32-bit chips are not affected by this bug. A user actually tested to see if his older iPhone will fail to boot, and the device seemed fine after the date was changed. Apparently, setting the date to January 1st, 1970, will set the internal clock number to less than zero in certain time zones. A lot of developers are pointing at this fact as an explanation to the bug. Of course, the easiest way NOT to bring your iOS device is by not trying to replicate the issue in the first place. As mentioned earlier, setting the date back to January 1st, 1970, requires you to manually scroll back to the year 1970 through multiple steps. If you are worried that a friend might be using this bug to prank you, there is also a jailbreak tweak called BrickingDate. The tweak will prevent you from setting the date back to 1970. It does so by blocking access to that year in the native Settings page. This tweak, however, will not prevent malicious app from changing the date through a series of codes and commands. It is still a tweak worth having, especially if you often leave your device unattended. Based on everything that has been outlined so far, what do you personally think about this bug? Will Apple release a fix soon? Let us know your thoughts in the comment section below. day by day we hear new bug in the iOS, i think there is no way to get a real secure operating system. anyhow, as you advised we need to stay away from testing that.